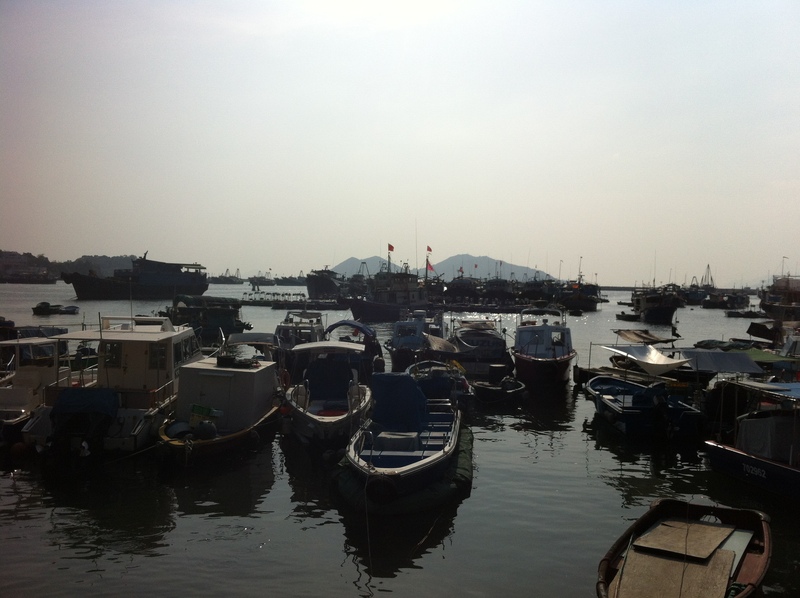 Today I woke up to bright sunshine in Hong Kong, which was fortunate since my friend decided it would be nice to visit Cheung Chau. 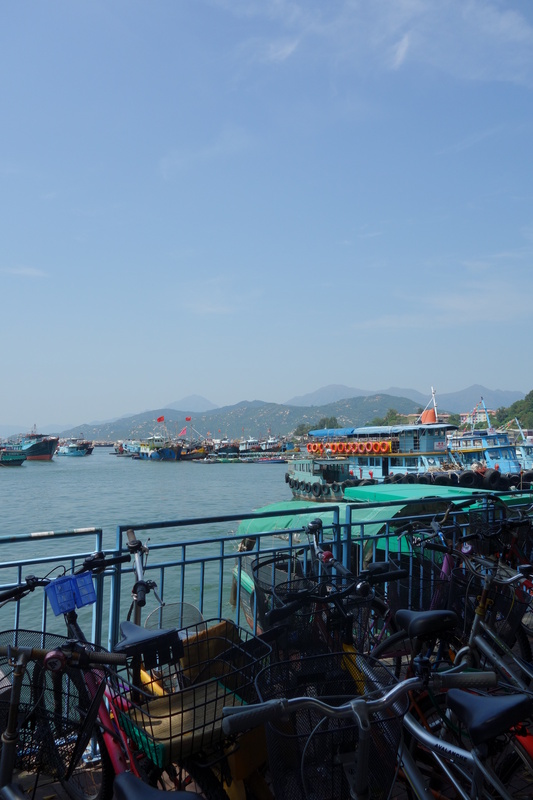 Cheung Chau is a small Island 10 km southwest of Hong Kong Island and is a very popular destination for tourism, as well as being renowned for its street food stalls. 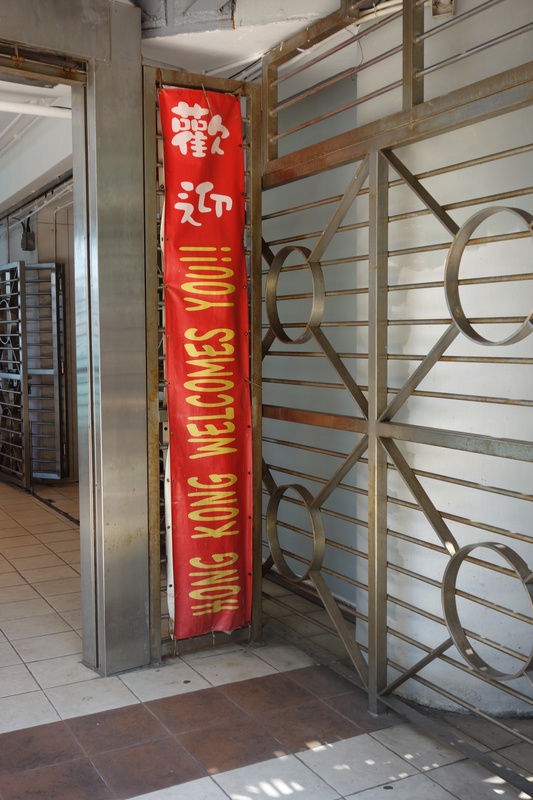 In order to get there, we got the train (MTR) from Tin Hau to Central, picking up some breakfast from a bakery on the way to Tin Hau station. I’m ashamed to say that I caved into temptation and got a coffee cake for breakfast, but I still feel that this was a better shout than the spam, cheese and tomato ketchup bun my friend decided to have! 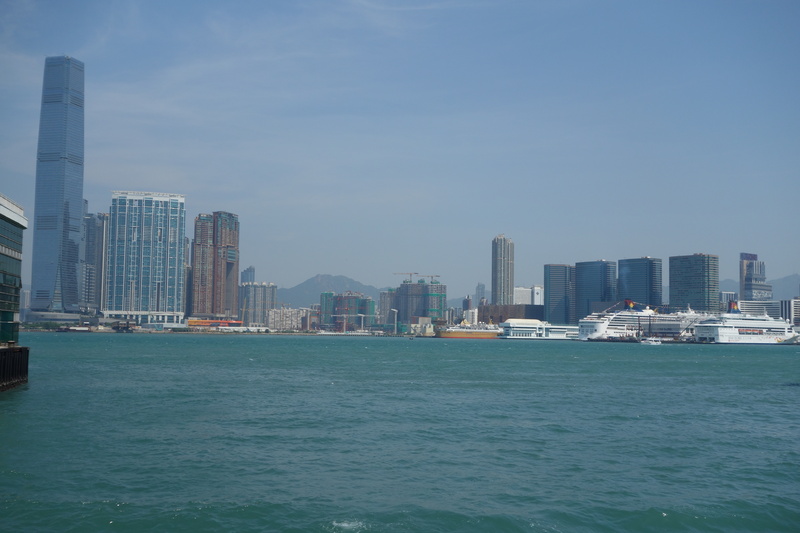 Upon arriving at Central, we headed to the ferry terminal (terminal 5) and just before we got there, were greeted by some stunning views of the harbour. 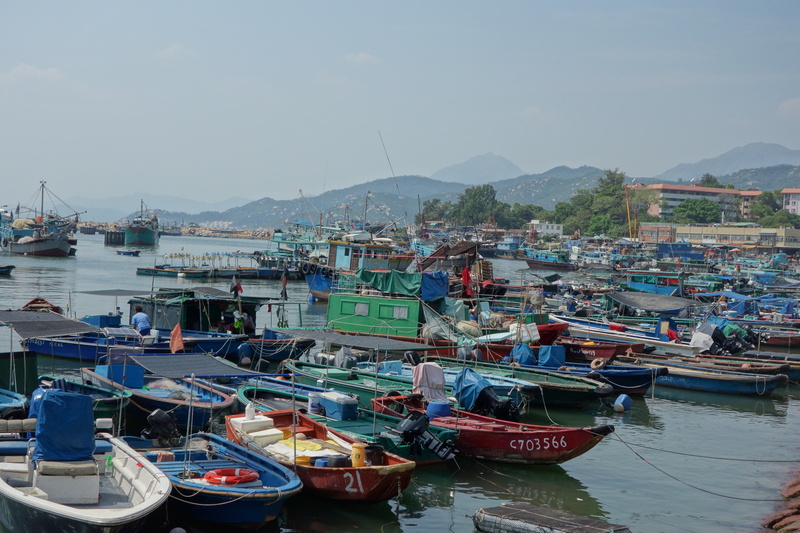 Upon approaching Cheung Chau, you witness beautiful sparkling water, with boats and fishing boats dotted across the harbour and a backdrop of stalls selling everything from jewellery and clothing to food stuff and bubble tea. Walking along the harbour front was probably my first prolonged experience of the humid heat that my friend told me I would experience in Hong Kong. Whilst this occurs on the main island, many buildings, shops and restaurants have incredibly efficient air conditioning, meaning that sometimes you even find yourself reaching for your jacket! 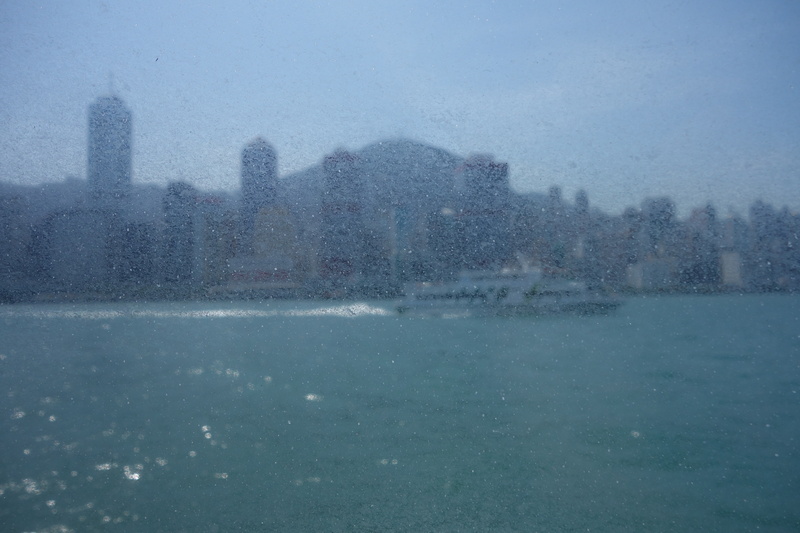 Nonetheless, the heat went hand in hand with the sun, which made all the colours of the harbour brighter and led me to make the urgent purchase of a pair of sunglasses (my original pair somehow broke in my backpack during my London to Hong Kong flight). 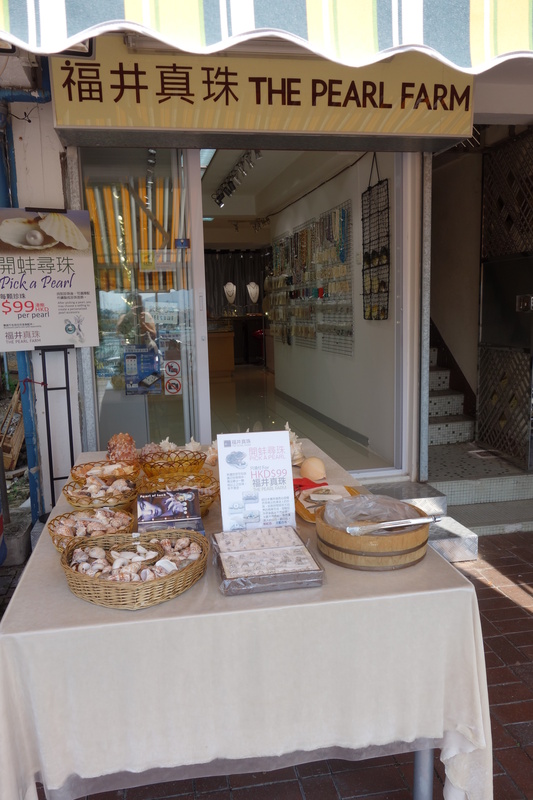 Alongside sunglasses, I found some over really nice gifts and was particularly impressed by a shop whereby you could select your own pearl from an oyster in a bucket of water. You then got to pick a pendant and watch the jeweller as she polished the pearl, drilled a hole into it (if necessary) and set it into the silver pendant (within whichever shape was picked). This is actually a gift for a friend I’ll be visiting soon, and I was also allowed to take a video of the pearl selection so have that to show her. But it does mean that I’ll have to block her from seeing this particular post on Facebook! Although the island has plenty of street food, and although my friend was desperate to try a twisty fried potato that was being sold on a street stall as well as mango filled buns, he decided to take me to the Rainbow Café along the harbour front for lunch. 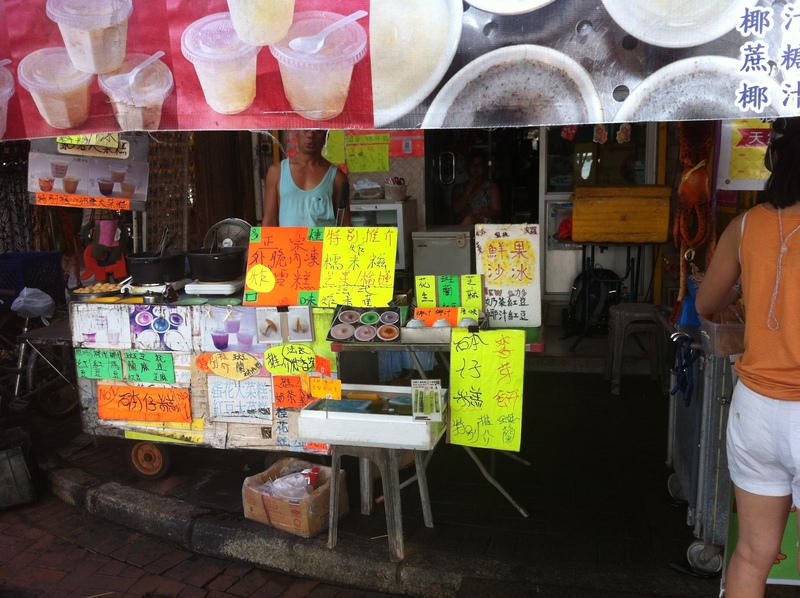 This was a good place to go because although Hong Kong caters very well for Vegetarians, fish is a fairly big deal on Cheung Chau and many restaurants serving Hong Kong food on the waterfront were using fish or fish sauce in their dishes. 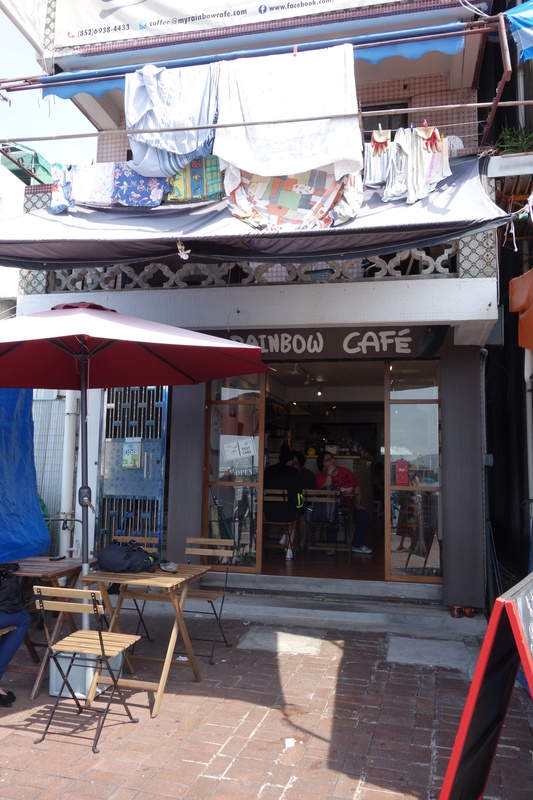 The Rainbow Café, however, was a contrast to this since it serves some Western dishes too (one of the rare occasions where I didn’t have some form of delicious Asian food). However, I couldn’t complain too much because part of me enjoyed returning to the home comfort of potato wedges and garlic bread (I’m not going to lie though, Dim Sum still wins). What was particularly lovely was being able to sit in an air conditioned café, which was light and cosy with little bear cushions and lots of written messages from past visitors, and sipping on an ice cold Lime Soda. 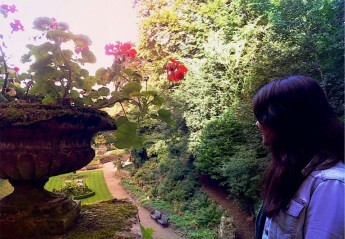 Total bliss when wanting to take a brief break from the glorious sun. After lunch, we went back to roaming around the harbour front. 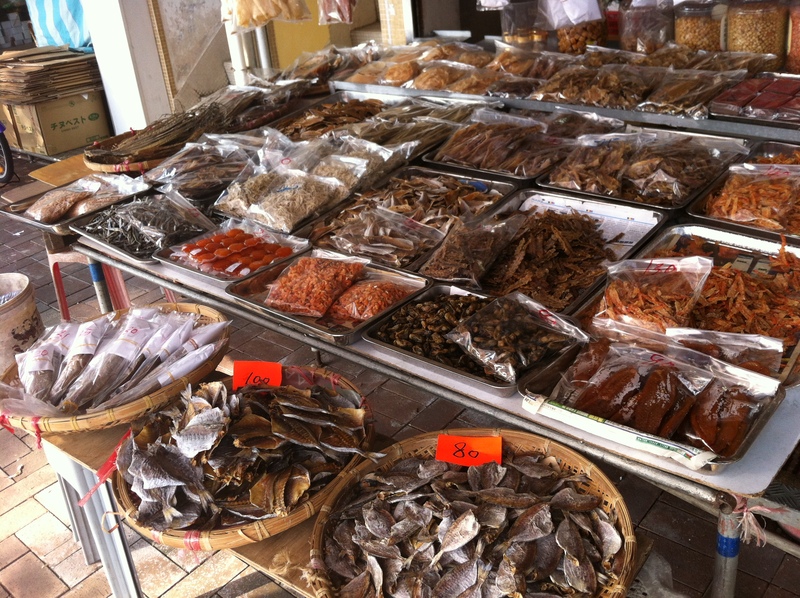 As previously mentioned, there are lots of street food stalls (see the first picture below) and fresh or dried fish stalls (see picture two). 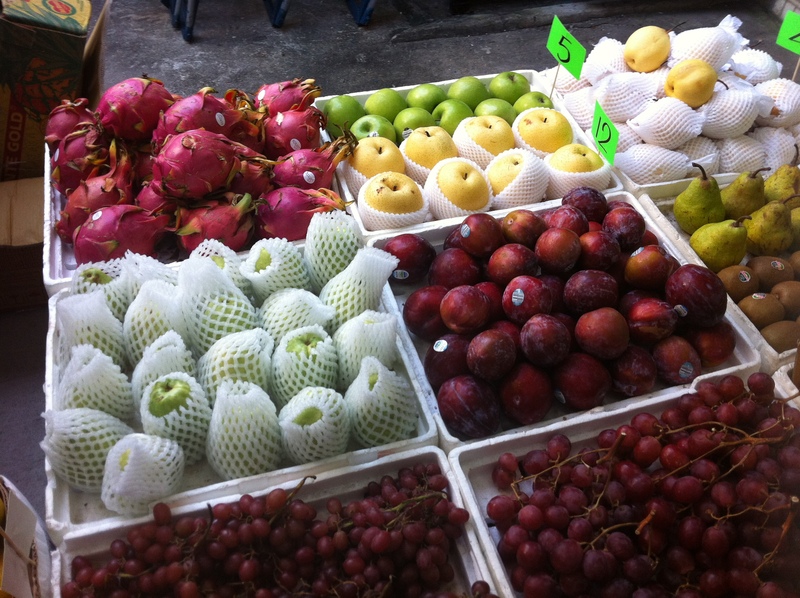 See the fruit in the white crotchet coats? That is to maintain quality and ensure that the fruit does not bruise. 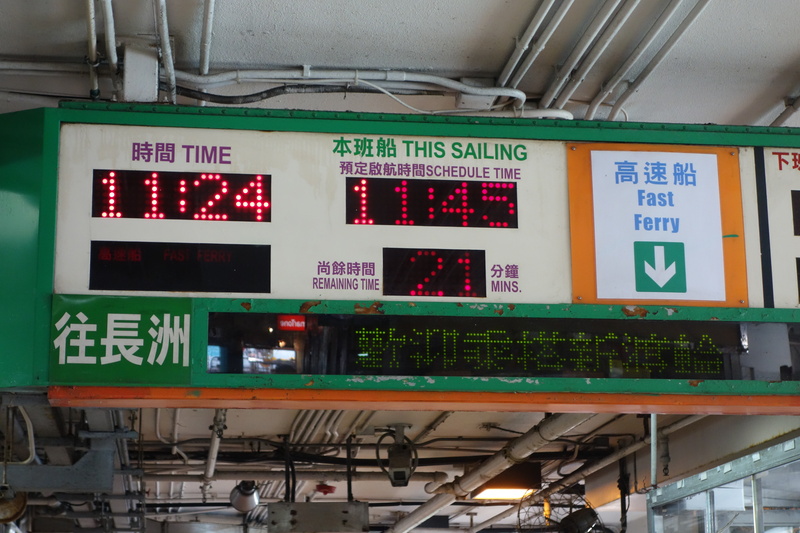 We only had to wait around fifteen minutes for the next ferry back to Hong Kong Island and the journey once again was relaxed and pleasant (cooler too since the windows were open this time). 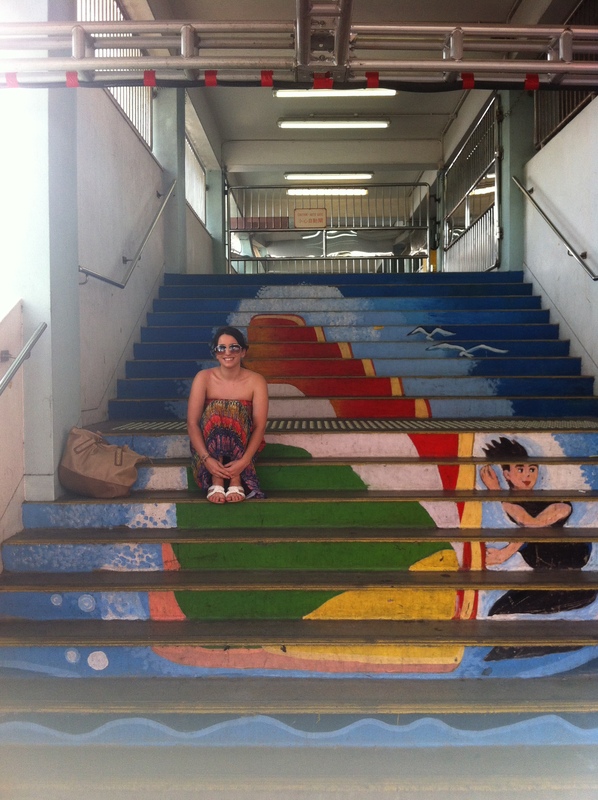 All in all, I’m very glad I got the chance to visit Cheung Chau- it was a beautiful place with a really friendly ambience. I hope you’re enjoying these blogs so far! On Wednesday (or tomorrow since this is probably when I’ll post), I’m heading over to Tokyo so I hope to keep you informed. I am very excited for Japan, so if anyone has a heads up on what I should see there, let me know in the comments below.